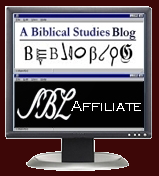 The Review of Biblical Literature (RBL) has been a great site for checking for reviews to get a quick sense of a book. You can search for books in the biblical field by title, author, subject, etc. RBL just announced that they now have their own RBL blog. The main function of the blog is that it will allow people to comment on the books and respond to the reviews. Bookmark 'em, Danno!